Bicycling at three years of age in the neighborhood of Madrid Orcasitas, her first competition was the 11 years in the Madrid suburb of Parla. It was one of the youngest professional in the history, Miguel Indurain or as Suso Blanco Villar. Con time solo 19 years came in the professional field 1980 achieving excellent results in its first year: General second in the Tour of Valencia, won a stage of the Tour of Germany to Bernard Hinault himself and participated in the World Championships in Sallanches. He has participated in 27 Grand Tours (VUELTA, GIRO Y TOUR) and in 6 World Championships in their 14 years as a professional cyclist. In the Tour of SPAIN f I hat 6 in 1983, who won the Vuelta Bernard Hinault. He has participated 14 times , as Domingo Perurena y Federico Etxave. Iñigo Cuesta, still active, holds the record with 15 shares 2008. The TOUR DE FRANCE has participated in 6 occasions and has won 4 mountain stage. Is privileged to have been won the stage with the highest end of the story of the Tour de France on the Col du Granon (Serre Chevalier) in 1986 Teka team with the final 2.413 meters. He has participated in the same year and finished the three major: VUELTA, TOUR, TOUR en 1990 and 1991. In the 90 got to be 6th in the Tour and the 91 made a great regularity in the three:10º in Tour of Spain, the 11th in the Giro d'Italia and 10 in the Tour de France. I do not know about you, I guess everyone will have their story, I liked playing with bike, with skates and a third option with a soccer ball. My story is that of a child, the son of Orchard Orcasitas (Usera district in Madrid) that the 3 years I learned to ride a bike GAC fat white wheels, also, walked with skates down the sidewalk in the grocery clients running over my parents. I liked to run a lot with skates, doing sprints down the sidewalk, occasionally, plundering a stone, I stopped the skid dry, gave me good porrazos, always walked with scabby knees between skates and bike. Also played football with my friends but I had more fun bike. I go with tongue out I liked, at school when he ran on foot was always the first. At 10 years began to take the crew races between friends who were basically 4: Elijah, his parents had a haberdashery, Paquito, his parents ran the Vizcaíno Bar, by Kiki, a neighboring block housing above shops and, the son of Edward the Orchard. Anyway, I just had a big bike, ride an Orbea brakes these rods, a relic, I'm talking of the year 1971. Shift, everyone was around the block simulating an individual time trial, era 1 km approximately, while another took the time and the other was put in a cross to warn cars that could come at that time were scarce. Pepe the butcher, seeing my sports hyperactivity convinced my father to let him take me to a federated career, He had been cycling, competed in the amateur era Rogelio Hernandez, who was president of the Madrid Cycling Federation over 20 years old, after his son, Santos Hernandez ran with me at ONCE. Also convinced my father to buy me a bike it, I buy a piece of iron in the Rastro was so great that I had to lower the seat all the way to the box. The butcher friend of my parents, began to train, left me his bike was milk, weighed nothing and had tubular, took me to the House where I started to spin like crazy Lake, asked each lap: Valgus for cyclist?? "It, if that vouchers ", I answered. Another day he said: "I'll Leganés to by meat, pulls ahead with bike I'm back with the car. That day I began to know my surroundings, It was an adventure, I had to climb the hill and around Carabanchel, Leganés Carabanchel, that of Cocherones was stoned and thought hell. The last test was to go to the Hill of Angels, upload and return, is about 10 km district, that day with me on a bike that girls tennis 18 years old, Pepe was dependent on the butcher, Pepe as always was behind us with his SEAT 1.500 ranchera. When we reached the base of the hill and start climbing, I seemed to be climbing the legendary Tourmalet, only knew from hearsay, I had heard on the radio when they narrated the adventures of Ocaña, Source and Merckx in the Tour de France. The Cerro de los Angeles has 1 scanty km, I found an eternal shore was harder than he had ever gone, worse he was the clerk who had to take the foot to ground. Since there was no evidence, There was a race for children in Parla (Madrid) and here we present: Pepe the butcher, I and SEAT 1.500 ranchera. With the Family Book we made registration, still had no license. I'll never forget that day, at the exit was on the verge of an attack of nerves, we were 15 children 11 and 12 years old, ready to beat us in a sporting duel, The circuit was 1 km in an avenue of 500 meters with two wheels on each end where we conducted the 180 º, I think the race was 4 km, I ended up 4th narrowly missed the podium entered. After my result and pressures Pepe, my dad had to buy me a bike to compete. Went to the store we Otero still continues in the same place, in Segovia Street, just below the viaduct, in the heart of Madrid de los Austrias. It was lovely, a frame of light steel tubing Columbus, sin racores, white, crafted by Don Enrique Otero, the group was Campagnolo and Clement Criterium tubular red. With all that as there was no other sport that could equal the cycling, that day the cyclist in me was born. I started cycling to 3 years old (1963) Mobylette GAC with small wheels, fat white. In the district of Orcasitas, now belongs to Usera, before Villaverde. My parents had a grocery store in the Town Directed Orcasitas (closest to the Toledo area) Bike riding and skating on the sidewalk running over my parents clientele. The first time I competed was the 11 years old, as I have already told, in a race organized in Parla Laudelino Hernández Peña Ciclista. I took my good friend and sports parents: Pepe, José Martínez Paredes, it was the local butcher and family friend, he had been an amateur cyclist in the time of Julius Jimenez. My bike was a piece of iron, which my father had bought me on the trail and had stuck to the box seat because if not reach the pedals. After I took the moral to my debut, between Pepe and I convinced my father to buy me a bike we better, my measure. Pepe was the expert because they had competed, led us to Segovia Street to shop and bicycle factory Otero. There Fernando, I took action and handle a bike with the box very light steel fittings, Campagnolo group, best. The wheels were Campagnolo hub with high spool and Clement Criterium Tubular were red. That was my nice white with red tubular Otero! This bike made me, handmade, Father Don Enrique Otero, his son was a great entrepreneur and cycling enthusiast: Enrique Otero (son) supported after the Spanish National Cycling and professional team ONCE. The next step was to begin to learn and get into a cycling team, after running in Parla. Mi manager, Pepe the butcher, took me to the bike shop where I was Laudelino Hernandez established his Peña, Street Hawk, Street next to La Oca in Carabanchel. There I learned the most important thing for cyclist: to repair my bike, a coser tubulares, technique, strategy, … afternoon Laudelino store was the meeting place, young people we met with the same enthusiasm, at that time any of them have been my best friends. The truth is that it was a true school of cycling. In Peña had youth teams and fans (sub-23), I ran as a child was alone and I took my father to the truck races with fruit, where we were many kids in the area, up 15 hemos bequeathed to IR Impostor blue Vans brand Avia, sitting in the back in the empty fruit crates and bicycles placed side by side, against saddle handlebar. When I reached the junior category and I joined the team that sponsored the rock curiously Mobylette GAC, what is life my first bike, kid, It was their brand. Laudelino Hernandez could not continue with the youth team and the second year I joined the amateur SUPER BEING, to meet the 18 years old. In step 2nd year youth won many competitions and was twice champion of New Castile, then there were a record autónomas.Conseguí communities, in 1978 went Trial Champion of Spain and ran by Regions 4 championships in Spain, It was my last year of youth, I ran the four road championships in Spain: two youth: the line online, fui 3º, and Contra Clock by Regions, We were the 5th. Then, July, I went to meet fans 18, Garrido and I chose to run the time trial Championships Spain regions, also ran before the Fund Online, hice el 12º, and won the Contra Clock by Regions: with 18 just turned years, the year was over juvenile, I was champion of Spain Against Clock (Sub. 23-Elite) Regional Teams by Faustino Ruperez, Eugenio Herranz (the “Belguita”) y Francisco Jiménez (no longer with us) a great friend I learned a lot of preparation. 17 years 1977. Stock in a career academy, I am the second row, Guillermo de la Peña in group head, then we would be teammates at El Zor professional, Ignacio behind Castilian “Monini” Isidro Altamirano and behind it was after the Zor mechanical equipment for over a decade. 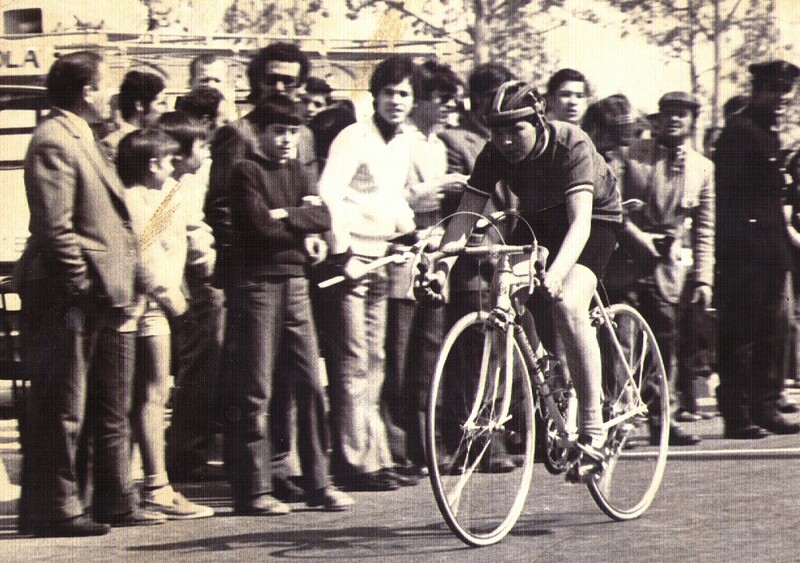 I ran in amateur before most of my peers, to spend at no expect to end the year, just when I turned 18 years old, July 1978, which allowed me to run 4 championships in Spain this year, two youth: the time trial by region and line. Y of the respective amateur, now you can not do. SUPER SER (1978) my team was during the end of the year who led my mentor Laudelino Hernández, I took the Tour of Ireland where he was at Sean Kelly and Robert Millar and others , I won a stage there. I was just turned Contra Champion Spain Watch by Regions in San Fernando de Henares, a circuit 24 km that arose 4 Returns, completing 96 km. The famous circuit Christ Rivas: San Fernando, Christ Rivas, Coslada and San Fernando. 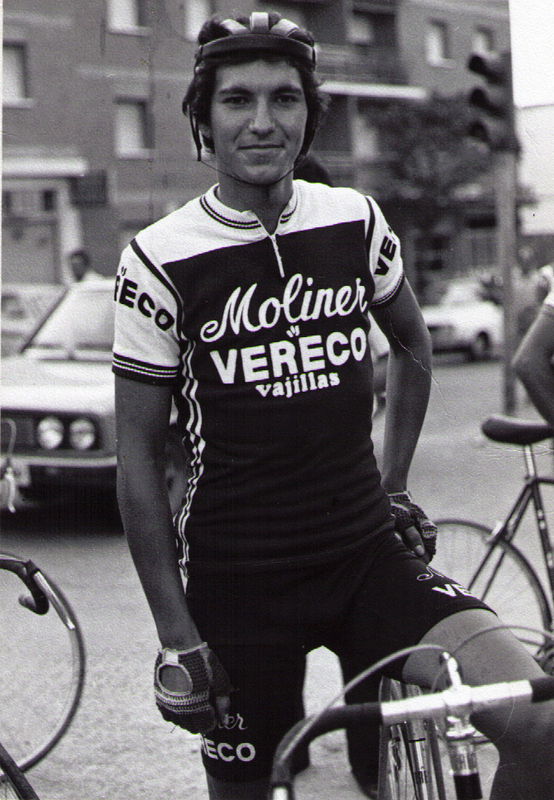 In 1979 fue mi año natural de amateur, Being Super disappeared, I was at MOLINER VERECO. 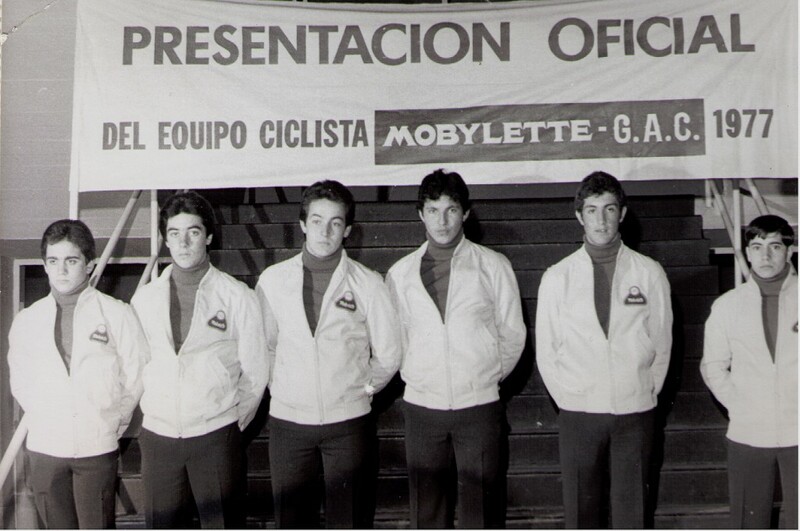 In Moliner Vereco we agree a very important generation in the history of our cycling: Pedro Delgado, Angel Camarillo, Jesús Rodríguez Magro, Guillermo de la Peña, Ángel Pérez Ocaña, Tomás de la Fuente, José Antonio Cabrero, Carlos Machin, …., we all become professional. The director of this great team, who won everything, Thomas was Nistal. Javier Minguez had been to the previous year, in 1979 debuted at professionalism Fosforera VERECO, be our amateur team where the subsidiary is subsequently nourish young runners. 1980, It was my first year of professional, Javier Minguez I joined the first team. I saw in some amateur racing and gave me the opportunity to spend so young, he discovered that there was something in me. I will always be grateful that I was a bad time and was not sure to continue in cycling plan long in amateur, I had thought about doing other things that lurked in my mind as it was studying Pharmacy at the University and help my parents in the family business was going very well. I later gave one or two years as a professional cyclist, to see what happened. I made my debut in the Tour of Mallorca, I ran there with Roger De Vlaeming rider who had won a lot of classic and was one of my idols. With 19 years 5 months I debuted as a professional in the Tour of Mallorca, after my second race was the Tour of Valencia, I was 2nd overall and subsequently participated, still 19 years old, in the Tour of Spain. That year was tremendous for how young he was, I won a stage of the Tour of Germany running with the Spanish Ramón Mendiburu who ran and participated in the World Championships held in Sallanches Route, the toughest in history, Gano Bernard Hinault, ground finished 12 Brokers, Juan Fernández won the bronze medal. My first big ext was in the Tour of Valencia that was my second competition, I surprised friends and strangers being second overall after the World Champion Cyclo Cross, large and also road cyclist, German Klaus Peter Thaler running team in Teka. But the fat was coming, Javier Minguez selected me for the team of the Tour of Spain, with 19 years I worked for Victor Faustino Ruperez “pulling the cart over 15 days, hard work from sunrise we did two cyclists, Ladron de Guevara and, until we could not continue with the first, average daily truck was pulling a 150 km from the exit. Tour ended like a noodle, When my mother saw me almost began to mourn. Running the Tour, working from the output, I did learn the craft of professional cyclist, I conducted an intensive Master 22 days, Javier Minguez first thing he taught me is that to be a cyclist must first be a companion for the leader and work till you drop, well I did and I learned, besides me hard and tough, I think that back in me began to build a great body strength so I always assimilated very well the major stage races: Tour, Tour y Vuelta. Photo of San Rafael stage of Angels (Segovia) My father Eduardo huts Goyal, Uncle Paco Huts, I, Carlos's son Pepe butcher, my cousin Paquito huts and Pedro Muñoz. At the end of The Return, at the stage of the ports of departure in Madrid to Segovia (Navafría, Canencia, Morcuera, Preserves, Alto del Leon) and end in Los Angeles de San Rafael, Ruperez was on the ropes in La Morcuera, ultimately overcome the test and could win the Vuelta. The stage was bestial, surely this has been the worst day I've finished a race in my sporting life, I could not climb stairs without holding the hotel and pull with arms. This was the day I suffered the most on a bicycle. 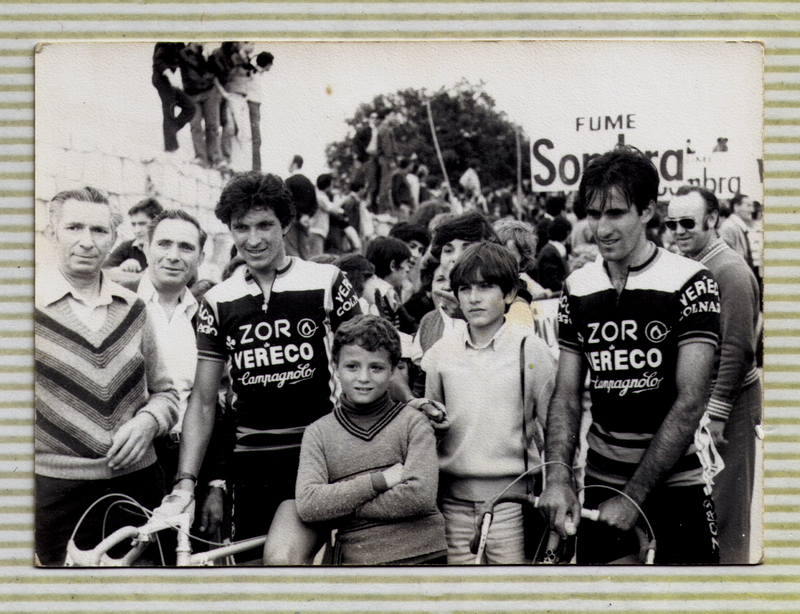 My great experience of the Tour of Spain 1980 was learning to work and to suffer. Thank you very much, igualmente espero que paséis unas felices fiestas!